Learn how to get started exploring this beautiful medium, with good quality materials in the minimum amount, to experience the pleasure and encouragement that results from working with the best materials. Learn and practice the variety of strokes possible with using pastel sticks, both to draw and to paint, and more! All this from not one, but two incredible pastel artists. 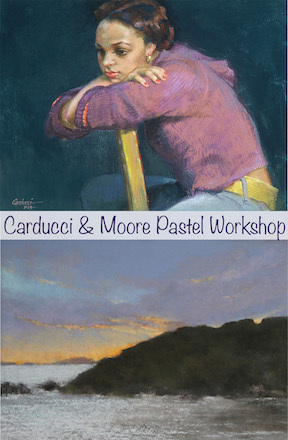 Two approaches to the pastel in one workshop. Much personal attention is guaranteed! Learn solid drawing skills pertaining to the portrait, including anatomy of skull, eyes, nose, mouth, ears and hands. Work with vine charcoal and white conte to correctly depict the 3D form, adding color to the highlights. The outcome is very effective and satisfying without getting in over your head with color. 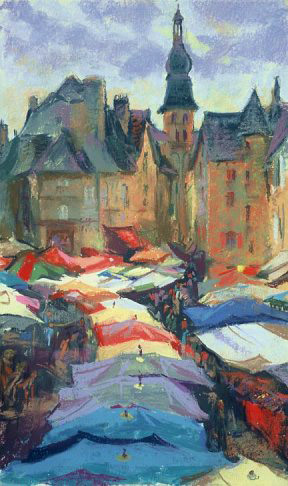 Visit Judy's gallery of plein air paintings in France done in past workshops hosted by Domaine du Haut Baran. 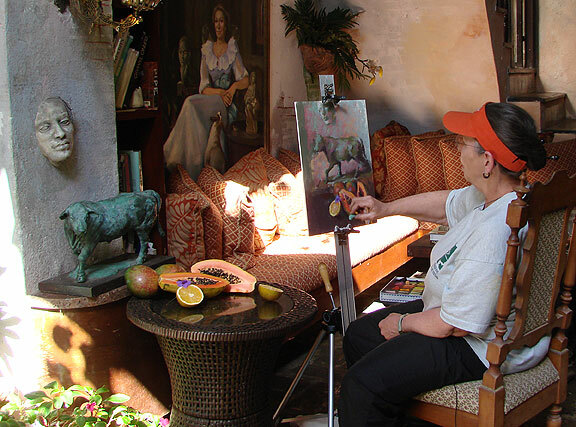 Check out more of Judy's en plein air paintings from Europe, Africa and Australia, and in the USA and Puerto Rico. 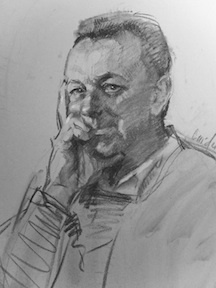 Check Judy's Drawings, or Alla Prima pages for images of portrait demos. AS PROMISED: Review of three weeks' use of the Easy L Lite, in Greece and Istanbul: very happy! Having done nearly 30 paintings in the past three weeks on mainland Greece, the Peloponnese, the Greek islands of Santorini and Mykonos, and in Istanbul, I can say that the Easy L met my every hope. It was wonderful to have a sturdy, lightweight, convenient easel that set up in seconds without a hitch, survived a sudden drenching downpour without warping, and held every size and shape panel I wanted to use for plein air painting. I have the standard box, and as a pastelist don't need the brush holder, palette, or brass hooks. I'd thought I'd use the brass hooks for my roll of paper towels, but find that the carrying strap works fine for that purpose. Note: I bought the box without the tripod and am using a light-weight German tripod. My framer cut a piece of black non-warping foam core to fit in the outside slot of the "wet painting" carrier on the back of the box, so I can keep small odd-sized painting panels in there, but I only used it once, since I paint on sizes that don't usually fit that space. I've asked the company if they will make me a box that doesn't have the "wet painting carrier" feature, which will result in an even slenderer box, and they have told me they will do that and it will be ready next month. I will then have two Easy L's - the standard and one custom-made for a pastelist. My Great American Art Works pastel box of 60 half-sticks fits perfectly in the Easy L, with just room for a large fat charcoal stick and a charcoal pencil and kneaded eraser if wanted, so that is a great convenience as the box of pastels then takes up no additional room in luggage. I found that the Easy L and the tripod fit easily into my Club Glove duffel along with my painting panels and clothing for three weeks, with extra room and weight to spare. For painting in narrow steep city streets and on mountainsides, I carried everything I needed - Easy L with box of pastel and charcoal, tripod, roll of paper towels) in one of the featherlight Signilar recyclable washable bags over my shoulder, with hands free for a hiking stick and the balance one needs in her 80th year. 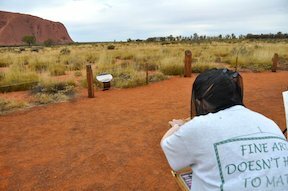 Bottom line: Beautifully made, sturdy, smoothly operating, convenient, light weight easel for travel and plein air painting. Served me well on rough terrain and in bad weather with no problems at all. Very fast set up and take down. Easily packable for artists wanting to take only one piece of luggage for foreign or long-distance travel. It is a wonderful design, but is not at all sturdy and not worth the price. Temperamental is not really the word I'd use to describe it; �fragile is more accurate. The very first time I used it, a piece came off and disappeared. �It was one of the pieces that holds the painting panel to the support. �I was teaching at the time, in Puerto Rico. �When I returned home, I notified the art supply store from which I'd bought it and they notified the company and a few months later a replacement piece arrived from the company. Last September, while painting on Monhegan Island in Maine, �I found myself having a hard time folding the easel. �I discovered that the entire front panel, which is plastic, had split in two, through a rivet, making the entire box unstable. The people who were with me advised that the company should give me a new easel, not just repair it. I have just talked with the manager of the company and he says he's sorry I'm having trouble with the easel but the warranty is for only a year (I bought it slightly over a year ago) and he "cannot" send me another easel. �He says "the best" the company can do is for me to ship it back (at my expense) and they will repair it. I am about to leave to teach in Florida, and shortly after that to teach and paint in Greece, Istanbul, Prague, Amsterdam and southern France, and then back again to Monhegan, as well as various other workshops in the United States. 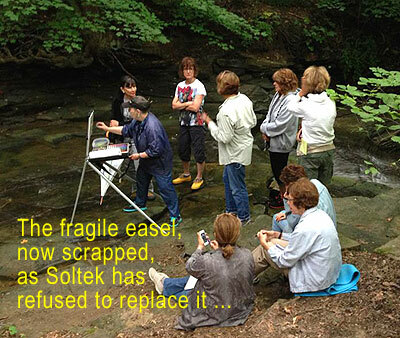 �I cannot be without a portable easel and cannot wait months for a usable Soltek. Of course the company "can" replace my easel. �He chooses not to. �He tells me "If you hadn't procrastinated" and had called before the year was up, he could have replaced the easel. �So it's MY fault. �And he's �- repeatedly - "sorry." He chooses not to replace what is either a lemon or simply a fragile design. I wonder how many other lemons there are waiting to be bought? �Or is it just too fragile for its design, and needs to be made of better materials? I am warning all my students that, if they hope for a Soltek, this is the kind of experience they may expect for the high price. A man from Soltek contacted me and said that HE, not the man I talked with on the phone, is the manager. �He said he will send a replacement part and I can fix the easel; �he compares my asking for a new easel to expecting a new car when mine has a broken windshield. �However, this is not a windshield - it's the integrity of the whole body -- unsafe to drive. He told one artist who wrote to the company in response to my caveat that the company prides itself on its good customer relations and he is in touch with me to "take care of " me. I have just received a package containing a replacement for the second broken part to my Soltek easel. I had told the (second) man claiming to be the manager that this was not a satisfactory solution to the problem. He has ignored that. Meanwhile, I am researching other easels and learning a great deal from colleagues with many years of hands-on research and satisfactory experience which I will share. I have been hearing from artists	that they agree with my comments regarding the Soltek. �One person has posted on my Facebook page that I must have a lemon. �If so, apparently there are a lot of lemons out there, and that artist is rarely fortunate. Caution: �my experience shows that (1) a company employee lied to me when I phoned; �(2) the company representative does not stand behind the product; �(3) �blamed me for their choice not to replace the easel; �(4) �minimized the severity of the problem. Do not, therefore, take the word of anybody in the company if you are told that they have "taken care of" the problem. If and when the company ever does that, I will let everybody know right away. Bottom line: I am returning the part to the company which needs it because, as Mr. Wilcox sees it, any company that would replace an expensive failed product when it could send the customer a cheap part "would go out of business." So the Soltek is made of cheap parts and doesn't have the resources to stand behind the product. I am not in the business of repairing wrecks, so will take a new easel on my travels and scrap the Soltek. I've just received an e-mail from Mr. Todd Wilcox (the second representative of the company to tell me HE is the manager) telling me that if I box up the easel, he will have UPS pick it up at the company's expense so the company can "make sure it is fully repaired and fully functional." I have repeatedly told them that is not satisfactory. I have told him that when and if the company sends me a (new) replacement easel, I will put the broken one in the box the new one arrives in and send it back to them. This product is not worth the trouble of my boxing it up, waiting for it to be picked up, waiting (it was months last time waiting for the missing part) for it to be returned while being without a portable easel for my travels. To say nothing of the aggravation of trying to get the company to do what is right. 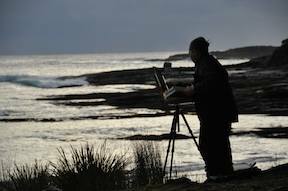 Meanwhile: I have just received the preliminary plans for a 12-day painting tour of Australia for next year, August into early September. Details will be posted as soon as we have the plans firmed up. So if any of you would like to start thinking about a wonderful adventure, this is a good time to do so -- and to be sure you have a reliable, convenient, light weight easel to travel with. Jacob, at Madison Art (whence I bought the Soltek easel) is trying hard to "take care of" the problem that the Soltek company will not deal with. His latest offer, which I have rejected, is that he will "ask Soltek to send [me] a shipping box with a pre-paid label... [and] maybe [i] will at least have a somewhat usable spare easel for all the money and aggravation [I] spent. I have repeatedly stated clearly that the only solution I consider acceptable is that Soltek send me a new easel to replace the one I have which is either a lemon from the start or a faulty product. For some reason, neither Jacob nor Soltek is registering this repeated "broken record." My response to this is puzzlement - what is interfering with my communication and how do I get heard? - and irritation: I'm being discounted and ignored while they come up with different plans. Meanwhile, Madison Art has no negative reviews posted on their site which describes the Soltek as "durable." I wonder if Madison will post my review? I now have a new different easel, which comes highly recommended and I have 'test-driven it" and will give it a strenuous workout when I leave for nearly a month in Europe shortly. I will report on what I think of my new "set up" when I return. The Soltek, meanwhile, is scrap. 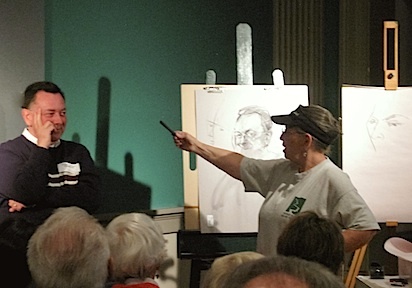 "It was a wonderful group at the Tampa workshop and, to my utter delight, included Emma Sims, granddaughter of the portrait artist Ann Kenyon. Six years ago, when she was 16, Emma participated in my workshop in southern France and there produced her first pastel painting. (See photo at left.) Now in her early 20's, Emma is an accomplished portrait painter! It was thrilling to see her and her mother again and to see the work this extraordinarily talented young woman is now doing." 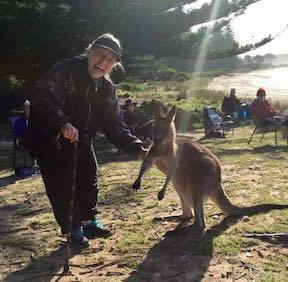 "Dear Judy, What a truly great experience it was to be your pupil for a few days! I just loved every minute of the classes, and lapped up your advice and enjoyed your lovely sense of humour. I feel so energized now, and inspired, despite my rapidly failing eyesight. You were just wonderful Judy and so full of life, love and energy. Thank you very sincerely for all you gave to me � and I hope we meet again; who knows?With my love, Margot"
Judy taught in Puerto Rico in February 2013 and was featured in the fall 2013 issue of American Artist magazine! Workshoppers stayed at the fabulous Gallery Inn. View Judy's Puerto Rico paintings here. Blogger and portrait artist Matthew D. Innis writes "Carducci ... had the audience roaring with laughter." 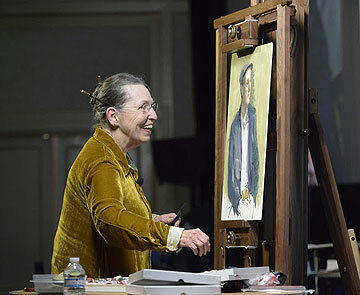 James Gurney blogged "She charmed the audience with limericks and solid painting advice as she worked. It was fun to be on the other side of the easel. Thanks, Judy! " Read Matthew's entire post to catch the spirit and excellence of this annual event with more photos of Judith's demo, start to finish. I continue to serve on the Executive Board and the faculty of the Portrait Society of America, and as Chairman of its Cecilia Beaux Forum. 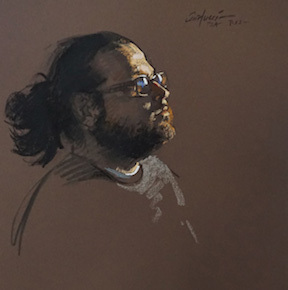 I conducted the Society's Portrait Academy at the Richeson School of Art in Kimberley, Wisconsin (see www.portraitsociety.org), and attended board meetings in NYC and Tallahassee, Florida, where I served on the jury that reviewed nearly 1,600 entries for the 2007 international portrait competition. 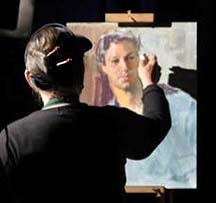 At the annual convention, "The Art of the Portrait," in May 2007, I served as moderator for plenary sessions, conducted the 2nd annual meeting of the Cecilia Beaux Forum, and did portfolio reviews. 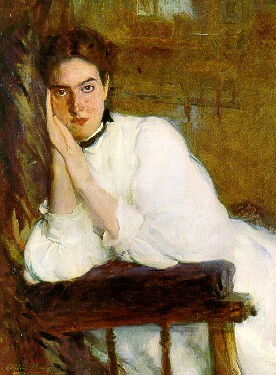 As Chairman of the Cecilia Beaux Forum, I have overseen the creation and activities of three committees: Literature, which writes and publishes articles on past and contemporary women artists; Exhibitions, which disseminates information on major shows for women to enter, and is planning a major exhibition of art by distinguished women in a prestigious venue; and Mentoring, which has begun a program of scholarships for women to receive career consultation with the eminent career and marketing consultant Calvin Goodman of California, and has designed an ongoing mentoring program for both men and women members of the Portrait Society. The Forum has a web page which is part ofwww.portraitsociety.org., and the quarterly journal includes a letter by me in each issue, as well as an article on a past or contemporary woman artist. 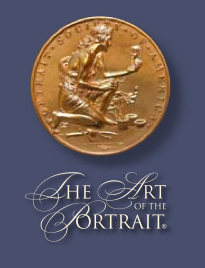 I am excited to tell you about the 2012 Art of the Portrait Conference in Philadelphia over Memorial Day Weekend, May 24-27. I will be holding a program, "Phases of the Artistic Journey," along with Ellen Cooper and Rhoda Sherbellas a part of the Cecilia Beaux Forum. 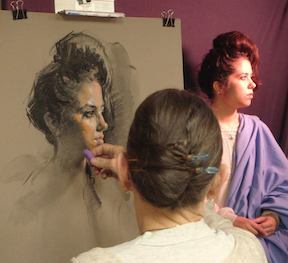 as part of The Portrait Academy, put on by the Portrait Society of America and the Cedar Rapids Museum of Art. Faculty were: Judith B. Carducci, Jean-Paul Tibbles (from England), Gwenneth Barth-White (from Switzerland), Rose Frantzen (from Iowa) and her husband, Chuck Morris. Oil on canvas, 33 X 25"
The Portrait Society of America and the Butler Institute of America are hosting "Inspiring Figures," a national show of the work of American women artists including work by artists of the past, work by ten outstanding invited women, and twenty works selected by means of a competition. 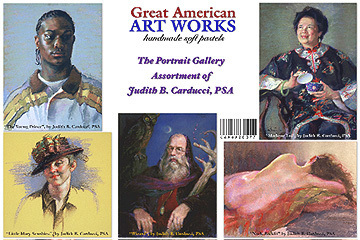 The show is a result of the work of the Exhibition Committee of the Portrait Society's Cecilia Beaux Forum which Judith Carducci serves as Chairman. Judy was one of the three jurors of the show, along with Dr. Louis Zona, Director of the Butler, and the renowned sculptor, Rhoda Sherbell. Oct 8 2- 3:15pm: Film, "Who Does She Think She Is?" By popular demand, this vibrant, award-winning artist with over 30 years of experience as an instructor brings the canvas to life in rich pastel. Robert Liberace models, as Judith makes us laugh and energizes the live audience and home viewers alike with her enthusiastic technique and vivid palette. New (2009) box top, same great colors! Judy's Plein Air Workshop in Puerto Rico was hosted by Signilar, and in 2009 Signilar filmed Judy's demonstrations for three instructional videos: two about plein air painting and one demonstrating still-life. Check them out on Judith's new DVD page. American Artist magazine editor, Steve Doherty, writes about Judy's workshop in southern Francein 2008. See article in the publication's Fall '08 Workshop issue. In late June and early July, while the lavender was in bloom and the weather perfect, Judy taught plein air painting in the Lot River Valley of southern France. Participants, working in the medium of their own choice: oil, watercolor, ink, graphite, pastel - painted medieval walled towns, farmers markets, and bridges dating from Roman Gaul, while living in the gorgeous Domaine du Haut Baran, owned and restored by William and Rosalie Haas of Cincinnati (see www.hautbaran.com). Rosalie cooked gourmet dinners, and breakfasts were taken outside on the beautiful terrace of the same golden stone of which the Domaine was built. 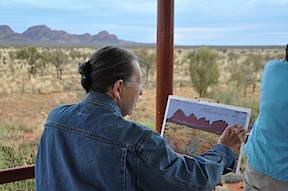 William, who spent much of his childhood in the area and loves its history and speaks fluent French, took participants on personal guided tours (including a trip to see the breathtaking prehistoric cave paintings), advised on wine and local food, and knew what subjects were best painted in morning light or afternoon light. The workshop was sponsored by Bob Strohsahl, manufacturer of Great American Artworks pastels, and each participant received a complimentary box of the pastels. He also introduced his new "cigar box" of 60 half sticks, designed for painting en plein air. See the photo in the article, showing Judy's painting of a lavender field and chateau, with the box of half sticks she used to create it. 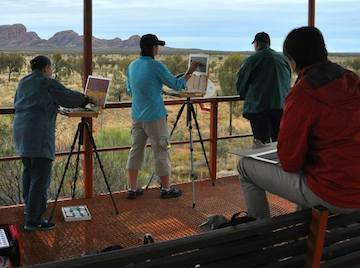 Participants declared the experience "the painting trip of a lifetime."